Inside Look: A talented ground game should help Virginia Tech this season. Ryan Williams is one of the better offensive players in the ACC and Darren Evans returns healthy after tearing his ACL last season. Jacory Harris may not be a Heisman canidate in the preseason but he should lead Miami to a strong bowl game. The loss of Jonathan Dywer will not hurt Paul Johnson's Georgia Tech squad was the option will be alive with Josh Nesbitt, Anthony Allen and Roddy Jones. With a lethal defense UNC should be a contender with tackle Marvin Austin, end Robert Quinn and linebacker Bruce Carter. No Bowden for Florida State. But they do retrun Christian Ponder. Boston College had a strong last season and star Montel Harris will get some help from offensive tackle Anthony Costanzo. C.J. Spiller is gone for Clemson but they avoided a dilema when quaretrback Kyle Parker decided to play college football instead of signing with the Colorado Rockies. 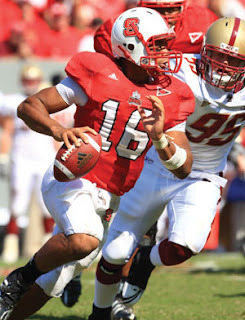 Russell Wilson could make NC State history this year. So the Wolfpack's days of Mario Williams are done but they'll settle with Wilson leading the team to a possible bowl game berth. Virginia will have problems in the tough ACC unless Ras-I Dowling has an unhuman season in the secondary. Duke has a fantastic wide receiver in Donovan Varner but needs a quarterback to get the ball to him. Luckily for Maryland Bruce Campbell was their only big loss. Riley Skinner started 49 of the 51 games for Wake Forest but they will have to settle with Skylar Jones who was a wide receiver last season.